Derek Sheils on the Burrows Engineering Racing Suzuki. Derek Sheils will compete in the final Irish National road race of the season at Killalane in County Dublin this weekend after taking some time out from the sport. Sheils skipped a series of Irish road races following the tragic death of William Dunlop in a crash during practice for the Skerries 100 in July. The Dubliner said he needed some time away to rethink his future plans and sat out race meetings at Walderstown, Faugheen, Armoy and the Ulster Grand Prix. However, he was back in action at the Classic TT at the end of August and Sheils made a late decision to race at the East Coast Festival event at Killalane this weekend in front of his home fans. He joins Davey Todd in the Burrows Engineering Racing line-up and will ride the team’s Suzuki GSX-R1000 as well as his own Yamaha R6. Team owner John Burrows said: “We’re delighted to have Derek back but we would have supported him fully regardless of his decision. “We’re back up to a two-man team for Killalane and Derek showed at the Classic TT that he hasn’t lost any of his will to race, because his speeds were strong and he was right on the money straight from the drop of the flag in practice. The event is being sponsored this year by hit TV programme Mrs Brown’s Boys. 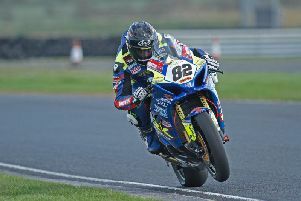 Ballymoney’s Paul Robinson is making his final road racing appearance after announcing his plans to quit the sport at the end of this season. Robinson hopes to sign off on a high by clinching the Moto3/125 title. Practice will be on Saturday today from 12 noon until 7pm. On Sunday, roads close at 8am ahead of the race programme.